Their victory over Spain in last summer's Confederations Cup showed how the fervour of the home support could be a difference maker. In Neymar, they have a talent who has the ability to win matches on his own (as he showed in the Confederations Cup), and in Thiago Silva, they have arguably the world's premier centre-half. They also have impressive strength in central midfield. The likes of Paulinho, Luis Gustavo, Fernandinho and Ramires are unlikely to be bullied by any opposition. In a sport where strength on the flanks has taken on increasing importance, they have arguably the best pair of attacking full-backs in the competition in Marcelo and Dani Alves. And the manager, Luis Felipe Scolari, has a well earned reputation in getting a team to perform in major international tournaments. Beyond Neymar, the team has a lack of devil that can make the difference in tight matches. While Thiago Silva's class isn't in doubt, question marks will abound regarding his central-defensive partner. Whether it's David Luiz or Dante, both men are talented, but prone to recklessness in a position where such behaviour can be costly. Also, the lack of a high-class centre-forward remains a question mark. However, Brazil's biggest problem may a potent intangible. The Selecao are not just taking on the 31 other nations, but the weight of history. The Maracanazo is one of the greatest millstones in all of sport, and its subsequent pressure could (understandably) be too much to bear. For Brazil, this World Cup has been a long time coming, and the players are being tasked with laying a 64 year old ghost to rest. Anything other than victory on 13th July will be considered a failure. The holders. They've won the last three international tournaments - making them one of the finest sides the game has ever seen. And while gained through questionable means, the acquisition of Diego Costa to the squad could give them the cutting edge in attack that they've sometimes lacked. There's not a stronger midfield in the tournament. The difficulties for head coach, Vicente Del Bosque won't be which of his midfielders to pick, but which to leave on the bench. And Del Bosque has proven himself one of the finest coaches in the history of football. The manner of their Confederations Cup defeat to Brazil was more alarming than the actual result. Time gets them all in the end, and there's an ever-growing impression that Spain's hourglass is fast running out of sand. After such sustained success, one wonders about the sharpness of their motivation. And the state of Xavi is a worry. He is the ringmaster of the team, but he is ageing and injury-prone. If he can't rouse his best form, then Spain's house of cards could fall in. The best firepower in the competition. Given the right service, this team should score shedloads. And in Ezequiel Garay and Pablo Zabaleta, they have a better defence than some may think. The service should largely come from Angel Di Maria, and anyone who watched the Champions League final will see that is more than up to the task. He has had a wonderful season for Real Madrid, and has the potential to be one of the stars of the tournament. And don't underestimate the motivation of the location. Winning a World Cup in Brazil is a unique prize, but doing so while wearing the shirt of the Albiceleste? The initial joy would be gilded by the fact that it would make Brazil sick with fury. Oh, and then there's that Messi guy. They lack a top goalkeeper, and there's a worrying lack of depth in midfield. If they were to pick up a few injuries, alarm bells will start ringing. Also, while this is a chance for Messi to ascend to the plane as the greatest ever to kick a ball, he's had injury problems, partly due to a case of burnout. While his loss can be easily offset by the brilliance of Sergio Aguero, "Kun" has also had a truncated season due to injury. And Argentina remain something of an enigma at this level. They should have won the World Cup in 2006, and departed in shambolic ignominy in 2010. Given the players they've produced in recent times, to win only two World Cups is an underachievement. A tournament pedigree that is second to none. Eyebrows are raised if they don't at least reach the semi-finals in these competitions They have a wealth of riches in midfield (even allowing for Marco Reus's absence with injury), and Manuel Neuer is probably the best goalkeeper in the world at present. Captain Philipp Lahm is not only an important presence, but is maybe the best all-round footballer in the game. Much of this squad have played together for the last two tournaments as young tyros. Now many of them have enough experience to cross the threshold of victory. And it will probably help if they don't end up playing Italy. Germany's reputation was one of limited technique, but a superb temperament in tight situations - what they call "winning time" in North America. The defeats to Spain in Euro 2008, and the last World Cup could be excused as a German side yet to reach its maturation point, and coming up against an exceptional Spanish team. But their tame loss to Italy in Euro 2012 hurt Die nationalmannschaft. Questions about whether this generation can win, as well as entertain persist. And the pressure on head coach, Joachim Low is huge. Fail to win the World Cup, and he'll almost certainly be looking for new employment. Also, the squad looks rather imbalanced, with only one fixed striker in the squad. Miroslav Klose has an outstanding record of scoring in World Cups - and is two short of Ronaldo's record, but there's little margin for error if Low relies on him for goals, assuming that he chooses to start Klose at all. A tough group means they have to hit their straps early. While they rely heavily on Mario Balotelli, he is just the type of personality who can get "hot" in a tournament like the World Cup. On paper, they have the best defenders in the competition, their midfield is replete with an impressive combination of technique and industry, mainly in the form of Daniele De Rossi and Andrea Pirlo. Also, in Marco Verrati, they have a potential gem of a player. If you're looking for an emerging star in Brazil, you could do worse than look at the PSG youngster. And head coach, Cesare Prandelli seems to be an excellent manager of both men, and tactics. His relatively firm moral code seems to have benefited the squad, and coaxing the team to the Euro 2012 final was an impressive overachievement. The line between a group of players being "experienced" and "ageing" is a fine one, and Italy may just be on the wrong side of that delineation. Also, captain Gigi Buffon had long been the answer to "who's the best goalkeeper in the world?" Well, he's just come off a moribund season for Juventus. His teammates, the trio of Leo Bonucci, Andrea Barzagli and Giorgio Chellini tend to operate better in a back three, rather than the back four favoured by Prandelli, which gives the defence a slightly unbalanced look. And Balotelli can be as maddening as he is inspirational. But with the somewhat baffling decision of Prandelli to omit Giuseppe Rossi from his squad, it makes Mario (as hard as it may be to believe) the most reliable striker Prandelli has. The lack of natural width in the squad could also be a problem. The pressure on the head coach should also be noted. Guiding Italy to the Euro 2012 final could be a double-edged sword. Expectations on the Azzurri have increased, and anything less than a semi-final place could see Prandelli out of a job. Had Arjen Robben kept his head, The Netherlands would be going to Brazil as the reigning world champions. Also, Robben, Wesley Sneijder and skipper, Robin Van Persie all have the capability to win matches on their own. The head coach, Luis Van Gaal is one of the sharpest minds in the game, and has been experimenting with a back 5, in order to free up space for Robben and Van Persie to hurt opposition defences. Van Gaal is taking over as Manchester United manager as soon as the World Cup is over. The febrile speculation that took place in the lead-up to his appointment could not have been beneficial to the Netherlands preparations. And beyond Robben, Sneijder and Van Persie, this has to be the weakest Netherlands squad in a generation. A lot of untried players make up the final 23, and some of them will need breakout tournaments if the team are to impress. Finally, there's the ever-present question of team harmony. Chemistry has long been a problematic issue of Dutch squads, with the team imploding on far too many occasions in the past. They've been drawn in a difficult group, and if they lose to Spain in their opening match, things could unravel very quickly. They have an absurdly easy group, which should give them time to get up to speed. In Paul Pogba, they appear to have discovered 'Patrick Vieira 2.0'. Even if 2014 is too soon for him, he's a good outside bet for the Ballon D'or in 2017. Beyond Pogba, there is also some decent quality alongside him in midfield, in the form of the PSG pair, Yohan Cabaye and Blaise Matuidi. Karim Benzema and Mathieu Valbuena also offer real quality in attack. And they have an underrated crop of central defenders. The fact that two of Laurent Koscielny, Eliaquim Mangala and Rafael Varane may not make the starting XI speaks volumes. Also, their atrocious showings at recent tournaments mean that expectations are pretty low, which make France dangerous. Genuine dark horses. France have had talented squads in the past, and yet were dismal. There's a reason why many aren't fancying them. This is a squad with a lot to prove. The shirt of Les Blues can weigh heavily, and many of the players have been more impressive for club, rather than country. They also appear vulnerable in the full-back positions, which could have a deleterious effect on their attacking rhythm, as well as their defensive solidity. And if France's collection of forwards fail to fire, it asks an awful lot of Pogba (especially with Franck Ribery missing the World Cup with injury) who we shouldn't forget, is still only 21. 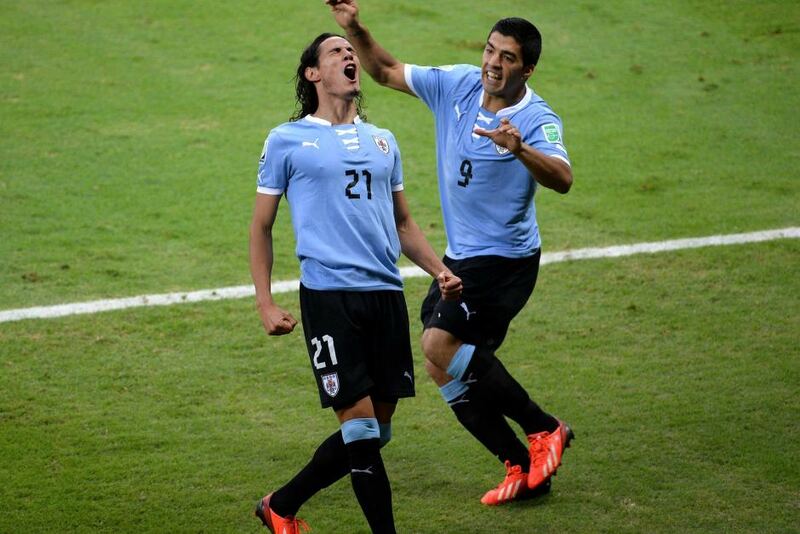 It's not Argentina or Brazil who are the current South American champions, but Uruguay. Since surprising at the last World Cup - where they finished fourth - this has arguably been the best Uruguay team since their glory days when they won two of the first four World Cups. Los Churruas main strength lies in their front two. Luis Suarez (who is detested by many for good reason) and Edinson Cavani are two of the most dangerous attackers in world football. Cavani tends to operate as the deeper of the two, and if they catch fire, they're capable of beating anyone. Also, they have a strong, if ageing, bulwark behind their attack. Walter Gargano, Diego Lugano, and Diego Godin are all canny defensive operators. Godin is also a useful threat at set-pieces. There is a lack of guile in the Uruguay midfield, and their penchant to sit deep and play on the counter can invite trouble, especially if the defence doesn't hold firm. Suarez is in a race against time to be fit, and even if he wins that race, he won't be operating at 100%. They didn't get the most amenable group, and they will probably have to beat one of England or Italy to make the knockout stages. Given their counter-attacking style, it would be foolish in the extreme to try and rely on scoring a hatful against Costa Rica. In terms of personnel, there's few countries with as much talent as Belgium. Over half the squad play for some of the best clubs in the Premier League, and their midfield is packed with exciting attackers, none more so than Chelsea's Eden Hazard. Belgium also have strength in their rearguard, led by captain, Vincent Kompany, and in goal they have Thibaut Courtois, who looks set to be the world's premier goalkeeper for the next decade. This is a generation that could be at the business end of major international competitions for the next 8-10 years. For about two years, the punditocracy have been proclaiming Belgium as the World Cup's "dark horses". But the point of a dark horse is that they're meant to be inconspicuous. At this point, aren't Belgium just... well, a horse? The injury to Christian Benteke could really hurt the squad, as it now puts the striking responsibility solely on Romelu Lukaku, which also highlights the lopsided nature of the 23. If Lukaku picks up an injury, the Belgian striking cupboard is bare. But more than anything, this is a side that is in new territory, and it's rare for any group of players to take to tournament football immediately. This could be a competition too soon for Belgium. At the moment, they look like a boxer who's impressed in sparring, brushed aside their first few opponents, but hasn't been involved in a scrap yet. We need to see what happens when they have to take a figurative punch, and I fear they may have a glass jaw. - While the obvious reference point is him coaching Brazil to win the World Cup in 2002, one shouldn't forget his good work in getting Portugal to the Euro 2004 Final. - Who, by the way, has to be one of the unluckiest footballers in recent memory. - Think about it. The European Championships take place in the summer of 2016. And it's in Pogba's home country.